Chapter 1277: The Opposite Can Too! Everyone in the Eternal Immortal Domains was looking up at the image in the sky, their eyes wide, their souls stirring, their blood pumping with an intimate, warm feeling. This was the mother of them all, the source of all their bloodlines. The Eternal Mother. Neither the Saint-Emperor nor Bai Xiaochun could control the reactions coming from their own blood. To them, the eye inside the bell was like a blooming flower that they instinctively felt intimately close to. Suddenly, all of the Eternal Immortal Domains smelled like a fragrant flower. Even the void around the world was affected as dazzling light shone out in all directions. Only the hulking Mortal Renegade remained completely still and unmoving, his powerful aura of murder and death suppressing the life force and the fragrant aroma. In all of the Eternal Immortal Domains, the only one to react differently… was the little turtle. He seemed to take it all in stride, and actually hid behind the Saint-Emperor, not willing to show his face. 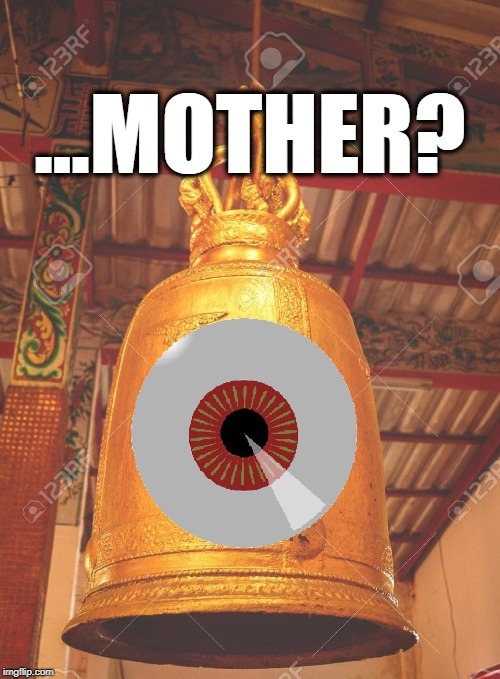 As everyone was shaken, the eye of the Eternal Mother looked around, seemingly confused. She had been asleep for a long time, and apparently, was having trouble reconciling the dreams she had experienced with reality. After a long moment passed, she spoke to the still-bowed Bai Xiaochun and Saint-Emperor, her voice slow and halting. Her voice was not awe-inspiring, but rather, warm. She truly seemed like a mother who had been woken up by her children, and was both smiling and sighing at the same time. The warm feeling in Bai Xiaochun’s heart caused him to feel more than ever like he was in front of his own mother. It was the same with the Saint-Emperor. The two of them took a deep breath, and then the Saint-Emperor took a step forward and began to speak in a very respectful voice. “The Enemy from Beyond is on the verge of waking up, and we have no way to resist him. Thus, we woke you up. Eternal Mother, please give us your approval to become sovereigns, so that we can fight the Enemy from Beyond!” The Saint-Emperor spoke with the utmost politeness, almost as if it were instinct for him to do so, and his expression was one of complete reverence. Then, she sent out some divine sense, which rose up and swirled around the Mortal Renegade for a moment before fading away. At that point, Bai Xiaochun and the Saint-Emperor heard another sigh. “When it is time to live, live. When it is time to die, die…. “There was once no reincarnation. Only after hope came to exist did reincarnation come to be…. There was once no Eternal. However, after hope came to exist, the Eternal came to be. “Long ago, I was not conscious. But in a moment of deadly crisis, I instinctively developed consciousness, and sent forth three seeds, which became three children…. “It seems… I only managed to delay things. I have no way to end the catastrophe of nirvanic extermination…. “What a pity…. Sealing the Mortal Renegade sent me into a deep sleep, and despite having been awoken, I’m not back at my peak state. I have no more power of approval left. At the most… I can approve of one of you to become a half-sovereign.” Although the Eternal Mother’s voice was warm, upon listening to it more closely, it did not seem to contain much emotion. However, it was sincere. Clearly, it was just as she had said; upon awakening, she did not possess the power she once had in the past. One might think that it was a simple thing to offer approval for an archaean to rise to a higher level. But the truth was that it required the Eternal Mother to call upon the power of Essence, which would become a branding mark that would be placed onto the archaean. Her response caused Bai Xiaochun’s expression to flicker, and then darken a bit. As for the Saint-Emperor, he sagged in place, his face ashen. Before, all of his hope had been placed on the Eternal Mother, but now that she was awake, that hope was turning into despair. “Half-sovereign…?” he muttered bitterly. From the Eternal Mother’s words, he could tell that the path to becoming a sovereign had truly been severed! “I can’t remain awake for long. To remain awake for longer than ten breaths of time requires that I take a day of life away from all living beings in the world, my children…. “Hurry and make your decision….” Her voice was weak, and the glowing light that represented her began to darken as the eye slowly started to close. In his bitterness, the Saint-Emperor looked over at Bai Xiaochun. Bai Xiaochun stood there silently. The truth was that he did not feel bitter like the Saint-Emperor. He didn't want to become a half-sovereign; that was pointless, and would not secure a victory against the Mortal Renegade. The ball of light that was the Eternal Mother flickered, and the slowly closing eye suddenly snapped open, and focused on the child of hers that stood in front of her. A moment later, her soft voice could once again be heard. “So, it was you who woke me…. I can sense the fluctuations of your blood. In some respects, you have already surpassed my other three children…. And I can sense that you have acquired a qi flow that doesn’t belong to me…. The Eternal Mother’s reply caused Bai Xiaochun to sink into silence. He still didn’t understand. Although it was true that the approval of a world could give birth to a sovereign, he knew that many years ago, one person had become a sovereign without the will of a world. In fact, that person had destroyed worlds! Bai Xiaochun had witnessed that personally via the memories of the Worldly Daoist! He also knew that the Mortal Renegade’s rise to the sovereign level had something to do with his Dao. That much he had learned with the help of the Worldly Daoist himself, in the valley of the clouds. It was possible to understand the Mortal Renegade’s Dao by looking at the state of the surrounding void. It was populated by nothing but ruins, with all life force having been eradicated. All heaven and earth had been extinguished, casting everything into darkness…. The Mortal Renegade’s Dao was to exterminate everything, and that was how he had become a sovereign! Having reached this point in his train of thought, Bai Xiaochun’s eyes glittered, and he looked over at the glowing light of the Eternal Mother. Yet again, the Eternal Mother’s eye snapped open, and this time, it shone with unrivaled splendor. It was as if Bai Xiaochun’s words had been filled with a bizarre power that caused the Eternal River to tremble, and the Eternal Immortal Domains to shake physically. To the Eternal Mother, it was as if his words had somehow stirred the foundation of some natural law! Even the Saint-Emperor and the little turtle could tell that the Eternal Mother’s eye had opened wider than before, as though she were now completely and utterly focused on Bai Xiaochun alone. It almost seemed as if she were inspecting him on the deepest of all levels. Shaken, Bai Xiaochun stood there, looking at the Eternal Mother. After a long moment… she retracted her divine sense. Sounding weaker than ever, she said one last thing to Bai Xiaochun. The instant Bai Xiaochun heard her words, his previously grim eyes began to shine brightly. 1. Important: the term that I’m translating as “nirvanic” here is actually different from the term I translated as “nirvanic” in ISSTH. The basic meaning of both of those terms is the same, and they are synonyms of each other, but the Chinese characters are different. In the case of the term here, it implies both calmness and extinction, and thus is a nirvana of complete death. Hey everyone, in case you missed it, check out my analysis of "Why wuxia is better than xianxia".